Sill in the grillin’ mode. Might as well enjoy it while the season lasts. This time it’s Glazed Pork Chops. A common enough entry. 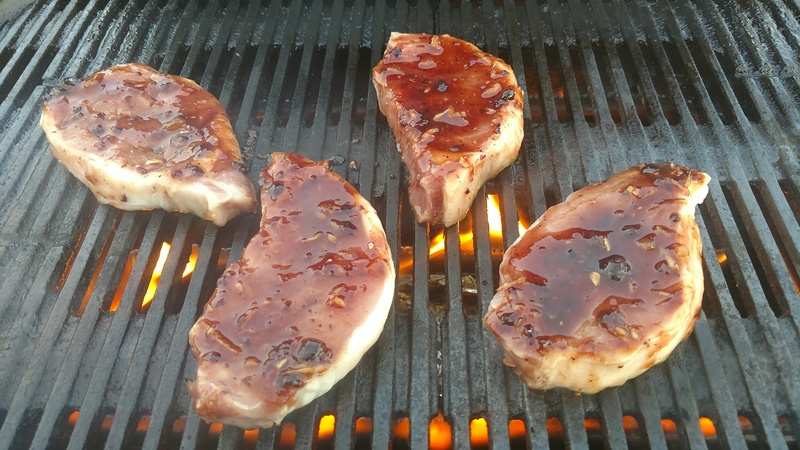 But, when one thinks of glazed pork chops, grilled or not, it’s pork chops smothered with orange marmalade. That’s been most of the recipes I’ve seen. Well, it can be done with any glaze, not just orange. Recently I scoured the fridge and discovered I had some leftover red raspberry and wild blueberry jam. Two small, half empty bottles, and still good to use. I mixed them all up and I had a suitable delicious glaze for the chops. The trick here is that you can use any kind of crushed fruit for a glaze, even cramberry sauce and and sweet mango chutney. You’re only limited by your imagination. 4 boneless pork chops, ¾-inch think, about 1 pound. Preheat a charcoal or gas grill for 6 minutes. For best results, brush the grate with vegetable oil before grilling. Fire should only be moderately hot. For the glaze, combine jam or marmalade (or a mix), soy sauce, lemon juice, and ginger. 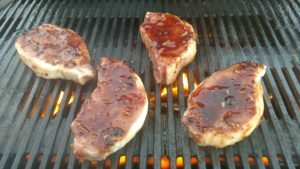 Place chops on grill, and pour glaze over chops. Close lid and cook 6 to 8 minutes or until meat is no loner pink. 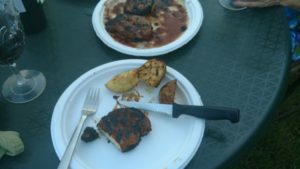 Remove chops and pour glaze from grill over all.